This article was originally published on the Film Independent blog and has been republished here with permission. Grantland writer Kevin Lincoln summed up “Ex Machina” beautifully when he wrote, “It’s a story about artificial intelligence, not-artificial intelligence, trust, love, parenthood, sincerity, watching Oscar Isaac exercise, the ethics of surveillance, the future of the human race, and beer.” For us at Film Independent, the film—with its incredibly alluring fembot in the leading role—is also a fantastic opportunity to explore the magical world of VFX, and the role of a VFX supervisor. How did the collaborative process begin? The initial concept art they came to us with was done by a comic book artist called Jock who Alex has worked with before on “Dread.” Those bits of art were photoshop paintings, very loose, impressionistic, to give a feeling of the kind of emotion and some ideas about what structure Ava might have, but very loose in terms of the brushwork so there was plenty of room for discussion and ideas to filter through. We then took those and did a bunch of concept art ourselves that was more to refine her look and also to start discussions from a practical standpoint. “Well if you want the robot to look like this, this is what we think the costume should look like to help us track the performance. What about if we did this to make the shoulders of the costume be on camera because that’s something that’s very difficult to rig in CG, because shoulders and shoulder blades are very complicated mechanical parts. So if we can make that real rather than being in CG, it will save you money, because it will make it easier for us to do the work.” Those are the kinds of conversations we had with concept art that we were generating to refine the ideas of what might be achieved. And then you get to the point where you have to you say “All right, we’ve gone as far as we can with paintings,” because paintings are great but you can hide a lot in a brush stroke. They have that impressionistic quality. But if you want to build something for real from it, you need to be extraordinarily specific about what you want, so it got to a point where we say, “Okay, we have to stop doing paintings now we have to go and build something.” And then you’re reacting to it as if you’re reacting to a sculpture or to a piece of engineering. And again we refine the design even as we were building it in 3D, right up to, just after the shoot really. And once we got a finished model and built a robot that everyone was happy with, then we could actually start doing the shots. Have you worked with directors before who don’t come in with concept art? And if that’s the case, are there pros and cons to both scenarios? Alex Garland is a very visually literate director. He can also draw very well, which is incredibly useful. It did speed up the process because he and I could sit down with print outs and the current state of the design and a bunch of Sharpies and a stack of paper and just sketch and come up with ideas and revisions of where we could go in the next round of illustrations or build into the actual model. It’s pretty normal for some sort of concept art to exist before a visual effects company joins the show. Simply because generally concept artists produce something to pitch the project to the studio, so something will generally exist before the thing gets greenlit in the first place. It’s pretty unusual someone will come to you with nothing. That’s not a problem, though, because we would generally come to generate our own concept art anyway, because we will generate art with the mindset of how we’re actually going to achieve it, considering the realities of VFX. So it’s a slightly more informed piece of concept art. But either approach can work. I think the key thing for all parties to remember is that it’s a collaboration. So you will often try a whole bunch of ideas that don’t work, and there’s an idea that people feel will be the most promising and you’ll push that and you’ll go off on a tangent. It is a process and it takes some time to get to the place that you need to be. And I think the potential pitfall is thinking, ‘Okay, here’s the brief. Just do it right now.’ That tends not to produce a great result because everybody needs to think about it and react to things. And over time it comes together. The whole film sort of hinges on your success of creating her as someone who is unambiguously a machine, but at the same time is believable as a woman, as a love interest. 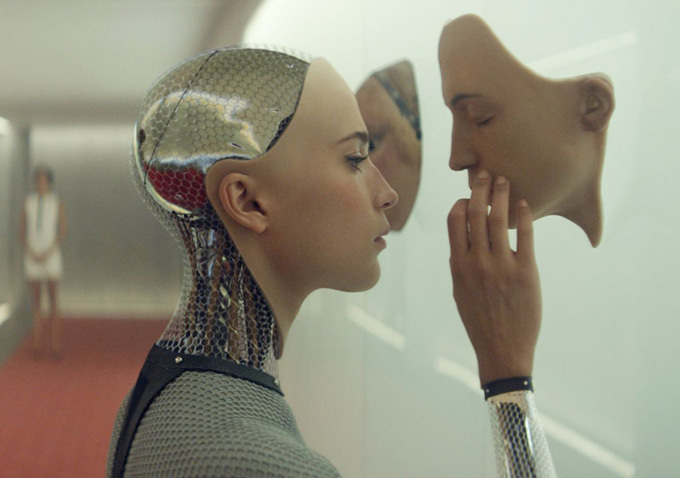 The film is a sequence just between two characters, [Ava and the male coder who is sent to interact with her]. For me, the film hinges on whether the audience becomes engaged in those conversations. And if you don’t become engaged in those conversations, to be honest, it wouldn’t matter what we did. You’d be screwed. There is no drama at that point if you don’t engage with those characters and that conversation. And that was something that we were very aware of as we were planning the shoot. So when we shot everything, we designed a way of working that didn’t involve having to put up a lot of green screen, that didn’t involve covering Alicia [Vikander] in tracking markers everywhere. And we actually incorporated tracking markers into parts of the costume design to make it as unobtrusive as possible, so that when everything was being shot, it was being shot just as a normal glamour scene. And then we would do our work afterwards, because if there wasn’t that engagement between the characters then we wouldn’t matter. And that was the overarching reason for the way we ended up actually shooting on set, which was to not use a green screen, just shooting a regular drama, get everybody out, then shoot clean plates, and leave it to us to stick it together afterward. What are things that would be helpful for a director to know about working with a VFX team if they’ve never had that experience before? I think that a lot of directors are very unfamiliar with visual effects. And there is an assumption that anything can be done, which is true up to a point. I mean anything can be done depending on how long you’ve got and how much money you’ve got. So I think the key to making successful visual effects is for as much planning as possible to happen up front, for everybody– from the production design to the DP to the director to the VFX supervisor to costume—to get together and flesh out who’s going to contribute what, at what stage, how that’s all going to fit together, and then shoot it on that basis. Rather than thinking that visual effects is this weird thing that we don’t understand until after we’ve shot the movie. The more it’s factored into the actual shoots, the more everyone is aware of what visual effects are required to do a good job, the better the end result, and the much less painful it’ll be for everyone involved in post production. Filmmaking is a team game. And it’s all about conversation and discussion and that iterative design process to figure out what it is exactly that we want. And none of that can be rushed and end up with a good end product, I think. 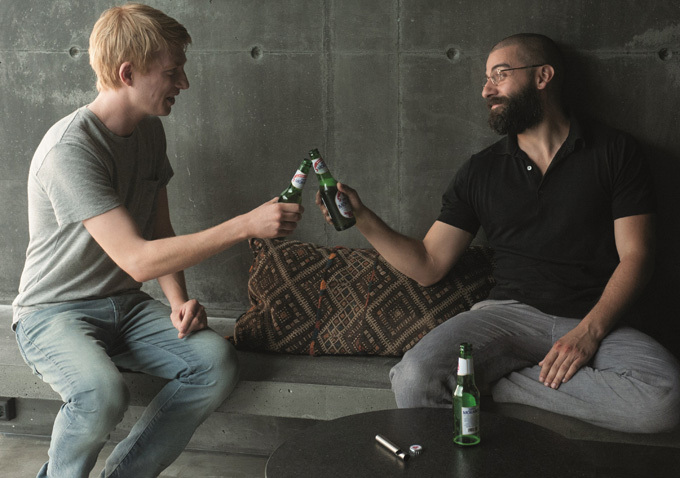 Can you give an example of how that collaborative process played out in “Ex Machina”? Is the kind of work you do at your shop accessible to a small budget independent filmmaker? We have worked on films with a less than $10 million overall production budget. We’ve worked on films where we’ve literally done four or five shots—not particularly complicated work. Most visual effects houses will try to maintain a split of very big shows that have very big visual effects and production budgets and consume a lot of time and a lot of people, with smaller shows, because you want to have smaller shows for artists to work on between bigger shows. And I think it’s creatively good as well. Is there anything else you can share that would be helpful for a filmmaker working with a VFX company for the first time? I can only reiterate that the more you can plan ahead, the more you talk about things, the more you work together and make sure that everybody is on the same page about what you’re trying to achieve, the better the chance you have of making sure that every buck you spend ends up on screen. 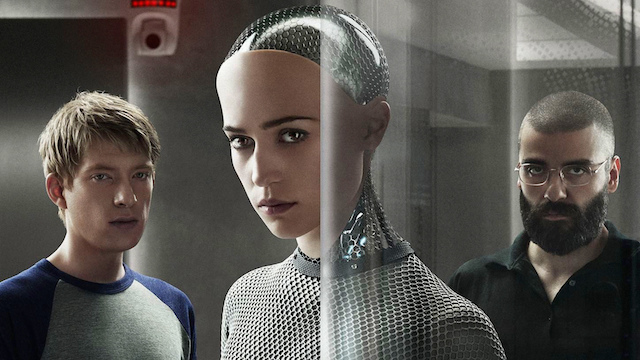 The amount of work wasted on “Ex Machina” was nil. Every single shot we worked on ended up in the film, which is rare. On a lot of big films, you have a lot of shots sitting on the cutting room floor. Sometimes you may have been working six months on a shot that’s not in the final film, and obviously that’s quite an expensive way of working. So the more you plan, the more you figure out what do you want and how do you want to achieve this, the better the chance you have that the money you spend you’ll get to see on the screen in the end and you’re going to get absolute maximum value out of it. The other thing is, don’t look on visual effects as being a sort of technical band-aid. Visual effects can help you tell your story. Visual effects can be the creative and contributes a lot. It’s a question of just engaging with the visual effects artist and they will help you make a better film. It can be whatever you want it to be. But the clearer the idea about what you want, and the better you’re able to articulate that, then the more chance you’ve got of ending up with a satisfactory end result for a reasonable amount of money.